Gonna be a little busy this Saturday and Sunday at Tampa Bay area ramps and waters. I checked in for my anglers yesterday for the annual PCF slam tournament out of the Vinoy. I was told yesterday that a record number of guided boats "73" will participate. Oneils, Gandy and Maximo ramps will see the brunt of the guides. Oh great, thanks for the info. I will not be using Gandy! Only do this event for one reason. If I can raise 1 dollar to help the cause I will be there. Raised 2 boys and never had to deal with what some have with their children. I Consider myself as the luckiest man around and have learned a lot about complaining about day to day BS. I don't see any "rant" and nothing to be sorry about!! We are all lucky, however November 8th please hurry and get here so this will be over. Man, was it rough this morning. Pinellas Point almost ate a maverick this morning and we had a reported gust to 30. Big thanks to the Snook and Gamefish foundation for the App to record the catches. Member Limitless is helping out as well but I have yet to find him. I was too wet after my bow stuff to go upstairs this morning and the ground swells in the Vinoy basin were trying to tear my boat apart at the docks. One more day to go and I need to upgrade. My Anglers first ever snook is a good one but not enough. It was the largest caught until about noon. We did a dozen smaller snook and trout up to 20 inches. My redfish still had some egg shell on him as I think he just hatched out yesterday. Yea, I stuffed the 21 MA today but so did several Dorados and other bay boats up to 26 feet. Crazy part was it rained about noon and the bay went slick calm. 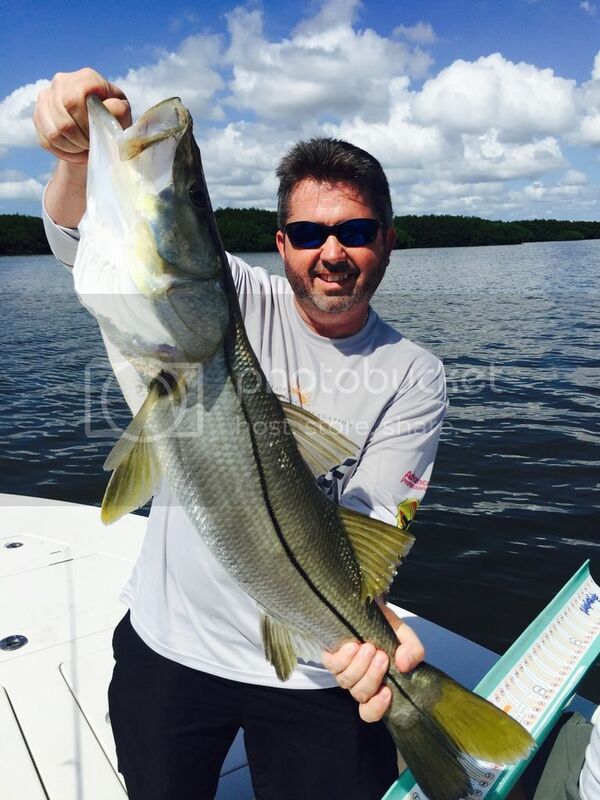 Nice snook, good effort in rough conditions, great cause Capt! We stunk up the place today. Fished very hard and had new anglers Today. "training day" except for one. The bite was poor for us and we just could not upgrade and we were in position to strike considering the very slow fishing. Very upsetting to see the water quality in the bay for this time of year. Seems the runoff/ redtide and a few other things have the bay a hit or miss option. A little wind blown on a shore line turns nice water to grey water in a tide change. Those millions of gallons of raw untreated sewage water are still roaming around. On a bright note, Wade Boggs presented his recently retired number from MLB. Number 26 got a little bonus and he and his wife donated the 26 K to the PCF this afternoon. Great weekend for the PCF and the children and once again thanks to member Limitless and the snook and game fish foundation for their help. Still a good event for a good cause. Too bad it didn't work out for you. I fell like a winner every time I fish this event. We did ok considering there were 73 boats and 266 anglers. 188 snook photographed along with 111 reds and 115 trout. A whole lot of small fish caught. Probably a lot more than what were recorded. We for example only entered fish that could upgrade us so the 25 plus small snook, trout and reds we caught were not recorded. Here is a good list of what went on. It kinda tells a telling story of what the fishing was like. A lot of the guides that had a tough time are Tampa Bay waters exclusive guides.